A very early start to our holiday, up at 2.15 a.m. for a 6am flight to Malaga Airport in Spain. Alas we did not get to bed until around 23.45 as we were packing. Inevitably we found it difficult to sleep, knowing that we had to be up soon. I also was in some discomfort due to a recently recurrent groin strain. I did get about an hours sleep. It is 2.15 a.m. already. Jump up and finish all those last minute things, like water the plants and switch off hot water. Don't forget to have breakfast, and then re-open suitcases to squeeze in all the things that are remembered by others at the last minute. We are eventually off by cab to Luton airport. I do like Luton airport. It is local, modestly sized and my airport of choice. In comparison, Heathrow, Gatwick and Stansted are simply a pain in the rear. In the queue for check-in, I picked up my hand luggage and it broke. Nothing unusual, except that it was brand new. I saw it in Asda a few days before. A folding back pack - perfect I can use it as a day sack and fold it up and put in my pocket when lunch is eaten. Alas within an hour of using, it fell apart. Fortunately Tie Tack was just opening up and I bought a back pack to replace it there. We fly Easyjet - I simply refuse to go Ryanair ever since they took an unspeakable approach to wheelchair bound customers. Putting aside my dislike of flying, the flight was pleasant. I sat next to Natasha. She took care of my flying worries, and even helped me to finish the Guardian crossword when I got stuck. She is a lovely girl. There was a delay of about an hour. It seems that there was one more bag on board than had been accounted for, and the bag had to be located, identified and removed. This was a reassuring reminder of serious security, as was me having to take off my new trainers to have them x-rayed. The general public don't mind delays, if it genuinely increases our protection from fundamentalists who would act in an ungodly way, given half a chance. The flight left at 7 a.m. and we arrived at Malaga Airport at about 11a.m. Spanish time. The airport is relatively new, open and airy. Unlike the people at Luton Airport who think it is a good idea to squeeze money out of customers by charging for trolleys, here they were freely available for the convenience of paying customers - as they should be. A short courtesy minibus ride later, we were at the car hire place and rented a dirty car substantial side damage and were off to our accommodation in Salares. I had programmed the coordinates into my new satnav and off we went. After an hour we stopped for a snack and bought some provisions. Another hour later we had driven 2,000 feet above sea-level - the car had an altimeter! - and were in Salares. We rang for final directions and were told that we should be in Saleres in the Lecrin Valley, not Salares! Much to our disappointment, the satnav told us that this was another 100 minutes away! The kids were especially disappointed as they thought that they were 5 minutes off a dip in the pool. Two hours later we arrived in Selares. I was now very tired - remember only one hour sleep last night - and would have needed to stop driving for a rest had we not arrived. We met the key-holder and were shown to the rather uninspiring front entrance. However, like the Tardis, we discovered a large and delightful residence inside. 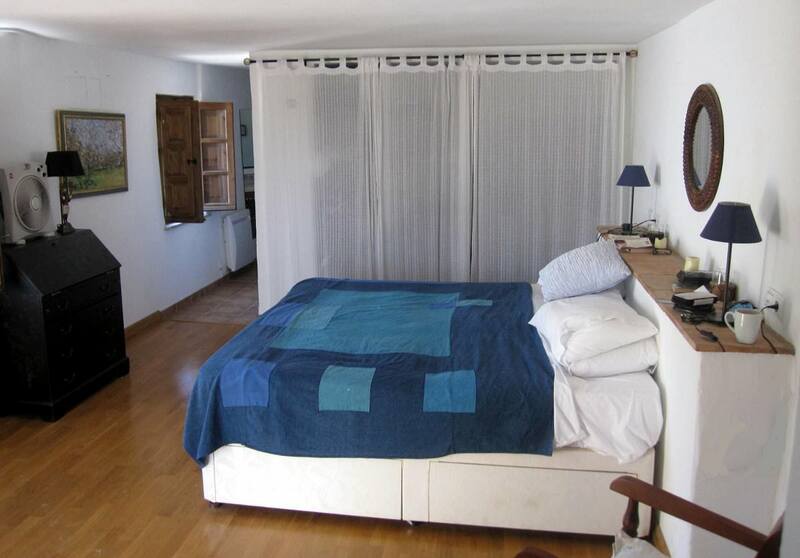 It is a holiday home from three converted flats and is over three floors. The best way to describe is to start at the bottom in the kitchen. Off here is the walled courtyard which contains the modest swimming pool, patio and covered outside dining area. There is also a poolside toilet and shower. Off the kitchen is a comfortable lounge with flat screen TV, DVD player and Satellite DVD. Both lounges are well stocked with a good and fairly recent range of DVDs and books. It also has WiFi. For the first time the travelog is written and published on the web during the holiday. At opposite ends of the kitchen are flights of stairs. One leads up to the second lounge. This is much the same as the first, except it does not have satellite TV. Up from here is the master bedroom which has en-suite bath, very large bed, shower, toilet and twin wash-hand basins. The toilet and bathroom is in an area off the bedroom, as opposed to a separate room with door. My teenagers found this disconcerting, although my wife and I, who stayed in this room, did not. The master bedroom has two balconies. Both overlook the beautiful Lecrin hills. The larger of the two has a fridge (for drinks and snacks) and a washing machine. Like the Tardis, we discovered a large and delightful residence inside. 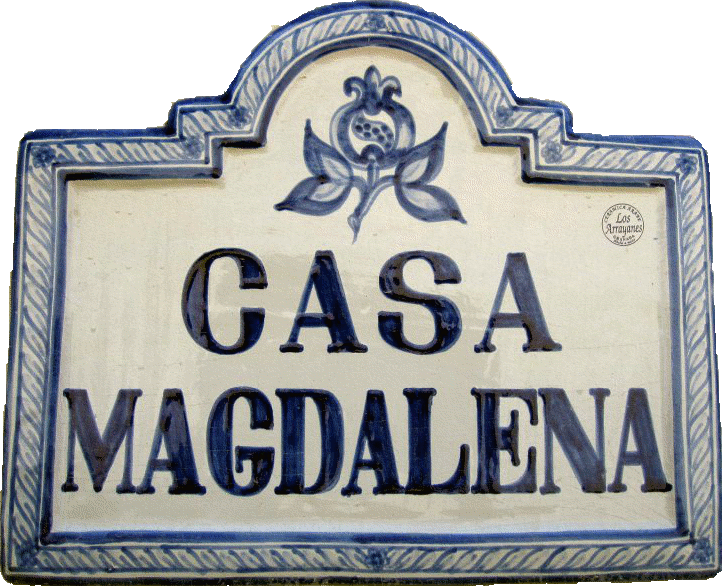 — David Thrale on Casa Magdelena. The other staircase, leads to two bedrooms. Both are doubles with one being bigger than the other. The bigger of the two has a small balcony and the small bedroom has an en-suite toilet. The other has access to a toilet too. Overall the standard of décor and cleanliness is great. It is very well equipped: washing machine, TV/DVD/satellite/WiFi. Swimming pool. The kitchen is well stocked on the basis of honesty. Also all the things that we are used to taking to self-catering holidays are here too; for example dishwasher and washing machine supplies, tea/coffee, washing-up liquid, cooking oil, herbs, They even had Marmite, and a fairly substantial range of partially drunk spirits. The only gripe is that the bedrooms are on different wings and are hence a bit of a trek. Also if you aren't able bodied, this is a no-no too. The kids couldn't wait to get in the pool, which they did while Michelle did her usual wonders with dinner. That was pretty-much that. Bed was calling the exhausted Thrale parents. We left Natasha watching one of those American sitcoms and left Ethan and Elise chatting in bed. We were awoken by mad tooting of car horns at about 9.30. I was half-sleepingly thinking mad foreigners, when I remembered that that is how shopping works in the shop-less village. A variety of hawkers: bakers, fishmongers etc., ply their wares from the back of a van, announcing their arrival in each village this way. We bought bread and later fish too. This way. The fish here is great. Unlike in much of the UK, it is fresh, cheaper and a wider variety. Today we bought sardines and squid. We spent much of the day relaxing at the accommodation with the pool taking centre stage. Aside from splashing and jumping, we played makeshift volley ball, stuck in the mud, and breath-holding width competitions. It was great just playing as a family without the distractions of housework, work, commitments to others, etc. In the evening, we drove to the neighbouring village of Albuñuelas. This was a bit of a disappointment and from here we drove on to Dúrcal. Dúrcal is a larger town. Here we bought a few provisions, then had a drink at the 7th Americas bar with the complimentary tapas. Disappointingly this wasn't anything vaguely Spanish, but five sorry mouthfuls of pizza. From here we moved on to the next bar. Here we ordered drinks while we awaited the racións1 that we had ordered. With the drinks came, a tapas. This was more Spanish: mushrooms in a white sauce accompanied by crusty bread. The kids, of course, hated it. Michelle and I wolfed it down. Then our meals arrived. All the children inevitably went for Pizza. I choose Carne en Salsa. Which turned out to be an uninspiring few pieces of beef with gravy on a few manufactured chips. Michelle chose something that turned out to be chicken breast stuffed with prawns in a sauce. She made the best choice! I should also talk about the flies. There are more than in the UK. They are everywhere and can drive you to distraction when the land on you. I presume locals just learn to let them do so, because wafting them away incessantly is certainly very tedious. I do confess to occasionally shouting at the flies. I know they can't hear, but it makes me feel better. Today was a slow start and time in the pool. We had a barbecue lovely lunch of our own making at Casa Magdelena: squid, sardines, salad and - my favourite - tomato and onion salad. We had repeatedly told the kids that we were going to the Alhambra in the late afternoon. Despite this, their was rebellion in the younger ranks when we scolded them for getting in the pool after lunch and instead asked them to go and get ready. Some unnecessary rebellion then ensued. We arrived at Alhambra in good time, even having stopped at a Lidl first to stock-up. I had created a make-shift cool bag using a frozen water bottle, a back pack and some newspaper. I am not sure what to say about the Alhambra. The first thing is that we timed our visit for the evening, after the intense mid-day heat. Alas, it was still unbearably hot at 7pm, and certainly too hot for walking around a large area sightseeing. Very soon we were all weary, and Ethan was whining about ice-cream and asking every 30 seconds "when can we go?". The parts we paid to see were the Moorish palaces from the Nasrid dynasty. The intricate symmetrical Islamic inspired engravings are admirable and decorative. I especially enjoyed the integration of water features and channels into the architecture and the Court of the Lions. It was calming and we all had a calm ten minutes in cool and symmetrical garden of the Court del ciprés de la sultana. Good for the eyes, but not the brain, due to the complete absence of information..
— David Thrale on the Alhambra palace. If you do not pay extra for the pre-recorded guide - which we did not, as we knew this would cause to many problems for a family with kids - there was no information at all. No name plates or information plaques. For example, it was not until I looked it up on Wikipedia that I discovered that the tall room was the Throne Room and the big inaccessible building near the entrance is the 16th century Palace of Charles V. The other irritant was having to pay extra for parking - despite paying over £40 for tickets. Overall, it is a calming place, good for the eyes, but not the brain, due to the complete absence of information. Well worth a visit, if not the cost. Don't go when it is hot! On the wasy back we stopped at a restaurant in a nearby village. Menu selection was tricky due to our limited Spanish. The tapas with the drinks was green mussels with onion and olives, which was great. The side dish of tomato salad was great too. However, the main courses of Cod, breaded chicken, roast pork and a seafood mix, were pretty disappointing. Today we collectively decided to stay at the accommodation. Yesterday was really tiring. Aside from fresh milk, we have all we need. To get fresh milk - as opposed to UHT - we would have to drive an hour's round trip. For late lunch we had a BBQ, of sardines, jack, squid and frankfurters for Ethan. We made a green salad; tomato salad and fruit salad. In the evening, Elise helped me prepare the food and she made a really tasty paper and onion soup. Michelle and I polished off a nice bottle of Cava. Wine is very cheap here, with prices starting at less than a Euro. For example, we saw a bottle of rose wine for 79 cents yesterday. That is just 60 pence Sterling - incredible. A good holiday day, although Michelle and I went to bed very tired. Pöe, Calle Paz. A very different decor and feel to this bar. 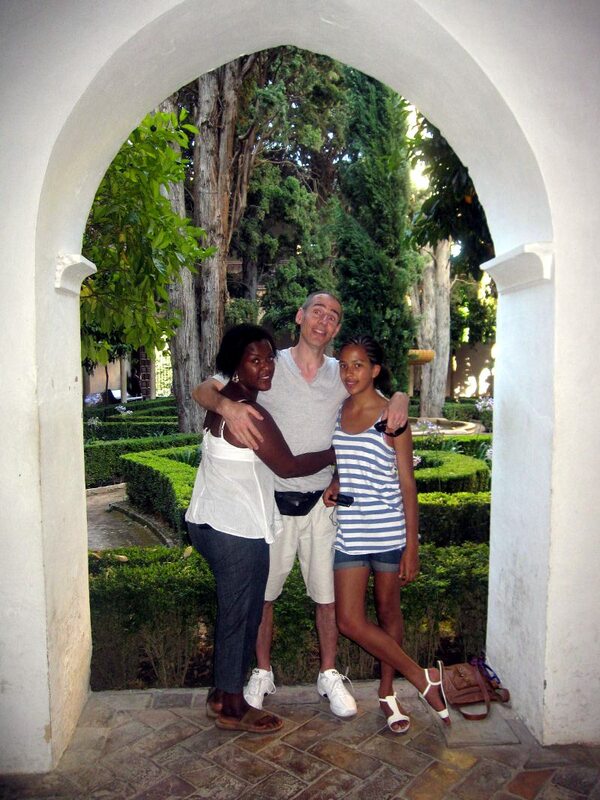 The owner was a very friendly south Londoner who came on a three day trip to Granada eight years ago, and never left! We were even introduced to his daughter and grandson Justin. Here we had Thai chicken (twice), piri piri pork, Italian vegetables, and pork kebab. It was all delicious. What I particularly enjoyed here, was how the children relaxed and we had a good conversation. No jibes or digs. No grunts or sullen spells. An open, pleasant and enjoyable discussion over drinks and snack. They must be growing up! La Bodega De Antonio, Calle Jardines. This was a larger, light and airy premises. It felt more like a restaurant. The book said that the speciality was fish, which suited Michelle and I. Here rather than the free tapas with drinks, we chose to have media racións1. Michelle and I shared fried fish. This was a real disappointment. A fairly tasteless selection of deep fried fish including cod, sardines, squid and prawns. Natasha picked squid. This too was deep fried, which is not our preferred method of cooking, and too was a disappointment. Ethan had roast ham. This turned out to be a school-dinner like (in the pejorative sense of the term) plate with manufactured chips, sitting in gravy and all covered with sliced roast pork (as opposed to the ham described). The whole thing was presented in an unappetising way. Elise had Baclava con Salsa. This was perhaps the best dish, but still only middling. Perhaps we picked the wrong dishes? We did see one couple that ordered squid with tomato salad. Certainly this would have helped balance the plate of deep fry tastelessness. The last bar aside, we really enjoyed our tapas crawl. When we left the last bar, I quickly got lost. Fortunately I had recorded the location of the parked car on the satnav and stuck this in my pocket. While not quite as suitable for walking as driving. The satnav did help us relocate the car. One thing that is very noticeable about Spanish bars is that they still allow smoking. As a non-smoking family with kids, the introduction of SmokeFree legislation in the UK in 2007, opened up a whole new world to us. We could go to bars for a pleasant pollution free experience. Spanish bars quickly brought back memories of the bad old smoking permissive days. On the way back, we stopped off at a cash machine in Granada town centre. It was a busy town centre and late at night. Here I just happened to see something amazing. A refuse truck was emptying litter bins. The amazing thing was that three litter bins were mounted on a large hinged plate. There was a mechanism that opened the plate (into which the bins were fixed), and the litter from all three bins fell into a single 1100 litre underground bin, which was brought to the surface by a hydraulic lift. While I am on about refuse (an occupational hazard for a health inspector), I should mention domestic collection arrangements. Collections from Saleres, a village 2,000 feet up in the hills, with a population of less than 200, was daily. That is right daily. In the UK, it is mostly weekly, with a trend towards fortnightly. There is a further big difference in that there are no kerbside collections. Instead residents take their waste to a communal 1100 ltr bin. Today started overcast. The only cooler day of our holiday. So far the weather has been a baking 33-38°C. However, today was around 25°C. On the first day of our holiday, I had spent about an hour in the pool, and that made my shoulders rather red and quite tight and sore - not sun burnt, but another half hour or so and I would have burnt. I took the precaution of wearing t-shirts when I went in the pool after that. So today was the perfect day to go to a water park - warm but overcast. We went to Aquaola water park in Granada. We arrived at 2.15pm, and decided to wait outside until 3pm, after which entry was €20 cheaper. Of course this caused much moaning by the kids. Eventually we were in and enjoyed the slides, all having a thoroughly good time. There was a great area with a raised diving area which was over a 3 metre pool. Elise jumped and I dived a couple of times from here. On the way back we bought a handful of provisions that we need for Sunday - when all the shops will be closed. 1. a. b. Larger portions of tapas, that are more suitable if you want a meal, rather than a snack.